Capt. Greg Mercurio leads the Yankee Capts crew in its commitment to quality service. As a dedicated fishermen (we don’t do this on the weekends as a second job), with a established 32 year reputation, nobody knows the areas we fish like Captain Greg Mercurio. Greg’s accomplished catch history and standards are maintained every day, every trip. The crew’s understanding of ocean conditions, bottom structure and behavior of the resident and migratory fish results in consistently superior catches. Whether you are a veteran offshore angler or a first timer to offshore fishing, the crew of the Yankee Capts has the expertise and, more importantly, the positive attitude to insure that your fishing trip will be the best trip possible. 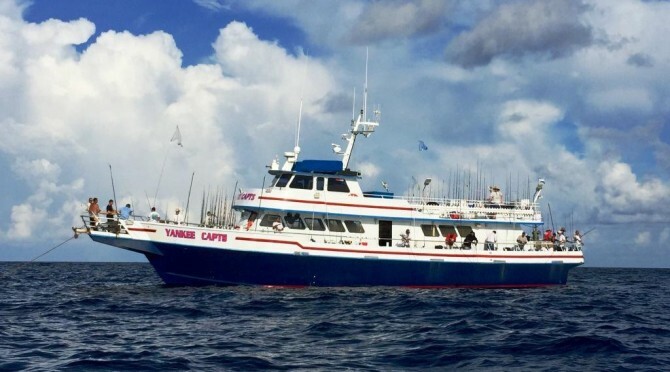 This equipment combined with Capt Greg’s 32 years of offshore experience, makes the Yankee Capts the best equipped and experienced Offshore overnight fishing boat on the east coast. The Main cabin is an enclosed cabin with windows. Inside you will find comfort and protection from the elements, Two bathrooms (located by the stern door) Bench seats, Dining tables, galley and the access point to the berthing compartments. The galley is open 15 hours a day with the exception of the ride out to the fishing grounds. Home style dinners, Hot Dogs, Hamburgers, Sandwiches, snacks, coffee, soda, beer and tackle may be purchased here. The berthing compartments (sleeping quarters) are located below the main cabin. They are semi-private, berths with a foam mattress, bunks in 3 separate compartments. Two compartments have their own air conditioner and heaters for optimal climate control. (2) Caterpillar 3412TAE which deliver 1500 horse power apiece. (1) Isuzu 20 Kilowatt generator supplying our A/C power. The Crew is trained to handle all types of emergencies from First Aid and Firefighting to Man overboard and other heavy weather emergencies. The crew perform and practice many Safety exercises and drills at regular intervals.